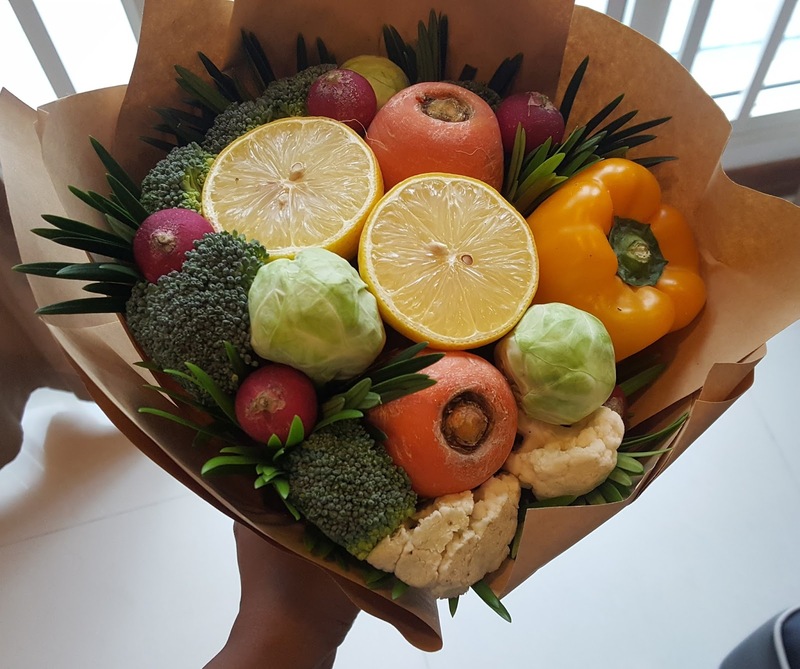 We are a local online florist in Singapore for 2 years and ongoing, with a mission to encourage others to show love, care, appreciation and gratitude through the simple gesture of giving flowers. We pride ourselves on providing affordable products without curtailing on the quality. Floral Garage offers Flower Bouquets(Freestyle bouquet, Premium Freestyle bouquet, Vegetable bouquet), Flower Stands, Party Supplies, gift baskets, congratulatory stands and also hampers(chocolate hampers, fruit hampers, baby hampers, Chinese New Year hampers, get well soon hampers etc.) for various occasions. Floral Garage Singapore aims to create as many collaborations as possible with the aim to aid a less fortunate community. Over the past year, we have helped raise funds for animal shelters, donated materials for flag days, and spent time with the old folks by conducting a floral arrangement workshop. These experiences have been highly enriching and eye-opening. It is a lot more than acknowledging, but also lifting a finger to help in our own backyard. 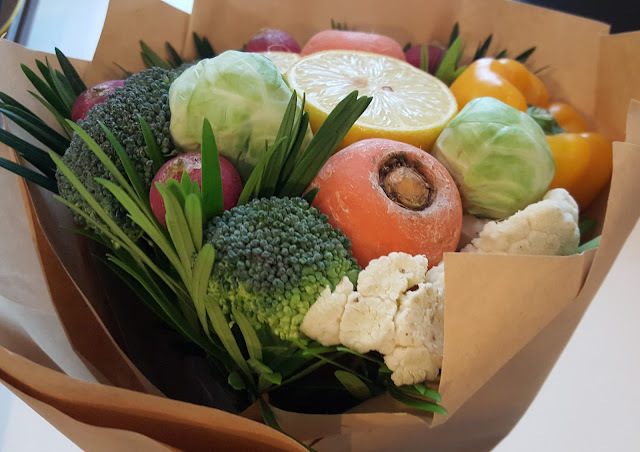 I chose to review the vegetable bouquet because it was something unique and I wanted to see how it would serve as a gift. Flowers are prettier but they would dry up in a few days but vegetables can be used by the receiver and would not be wasted. 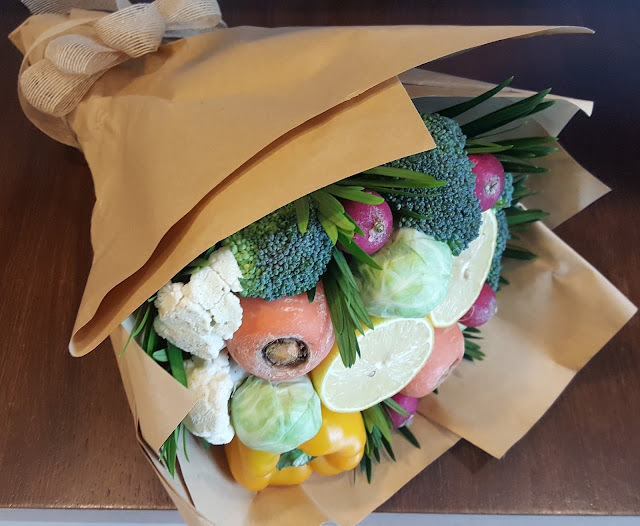 The packaging was extremely elegant, wrapped in a light brown paper and a cute bow attached.The vegetables were fresh and were pierced onto long wooden sticks to keep them in place and there were some leaves to give it a fresh look. 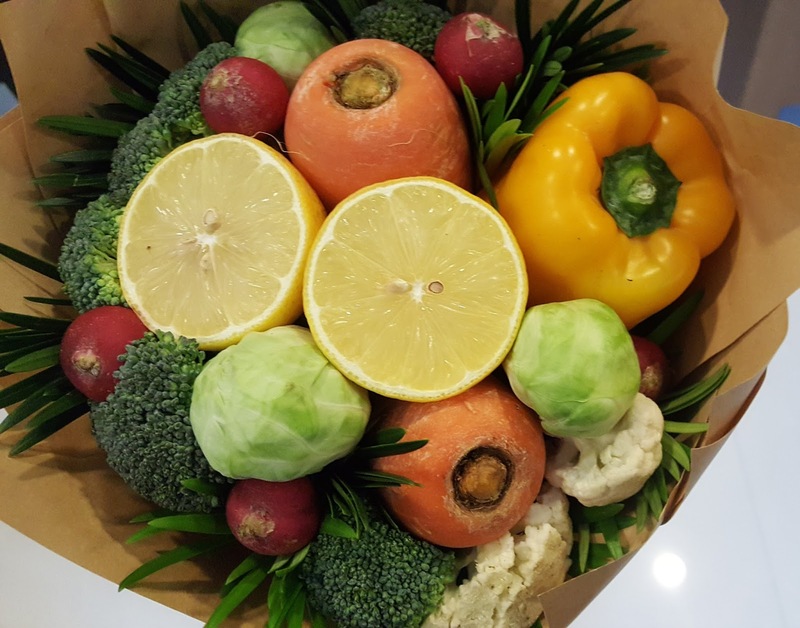 It had about 5 to 6 varieties of vegetables consisting of carrots, baby cabbage, cauliflower florets, capsicum, broccoli florets, lemon, and radish. The vegetables were quite fresh and looked clean and colorful. Ideally, there were about 5 to 6 varieties of vegetables but the quantity was quite less. There could have probably been more cauliflower and broccoli florets to give a more complete look to the bouquet. I had mentioned a particular time & date and the product arrived exactly in those hours which was amazing and there was no delay or waiting involved. Floral Garage specializes in same day delivery with just an additional $9.70. I was so impressed with how well they maintained the timings and I am sure I will choose their service for bouquets for their excellent delivery. Floral Garage is striving to improve their service more and more and has recently introduced additional wedding services like Bridal Bouquets, Bridesmaid Bouquets, car decor and so on. Price of the Vegetable Bouquet starts from SGD 49 to SGD 159. The vegetables could have been packed in a different way because I felt that the wooden stick was very sharp and personally found it tough to remove the veggies from that. The cellophane tape was stuck on the carrots and again it was quite tough to remove it. * PR sample but review is honest.